As seen in the November 2013 issue of Model Aviation. In June 2012, I had the opportunity to be a part of an amazing story involving an RC model of an AC-119K Stinger gunship that was built in 1972 by John Hupe, an Air Force officer, while he served as a navigator and sensor operator in the 18th Special Operations Squadron (SOS). John flew a full-scale AC-119K in Vietnam, executing search and destroy missions at night over the Ho Chi Minh Trail. Back in the Vietnam War, the gunships and special operations missions were part of the Tactical Air Command and the crews were known as Air Commandos. Today, the gunship mission belongs to Air Force Special Operations Command (AFSOC). In addition to being an Air Force officer, John was also a fledgling RC pilot. When he received his orders to go to Vietnam, he learned that there was an informal club at Nakhon Phanom Air Base in Thailand so he took his radio gear. Armed with engineering training from Kansas State University and a stack of tech orders, John decided to design and scratch-build an RC model of the AC-119K Stinger. His design featured a 72-inch wingspan and the finished model weighed roughly 10 pounds. John selected a pair of Enya 45s for power. Modelers then did not have the resources we have today. There were no Internet forums to ask for help and mail order was not what it is today. Order forms were mailed, accompanied by a check or money order, and then there was a long wait. Serving overseas in a war zone meant weeks or months would go by between sending for supplies and receiving them. To help alleviate these difficulties, John found clever ways to work around the challenges. He fabricated the wing spar from plywood he scavenged from a whiskey case and obtained paint from the base. Several aircraft serving in Vietnam, including the AC-119K, had wood and fabric control surfaces, so aircraft dope in the correct camouflage colors was readily available. John debated adding retractable landing gear, but decided against it. There were no commercial units available at the time that resembled the AC-119K’s mail gears and adding retracts would have pushed the maiden flight date beyond the end of his tour. He designed a set of scale main gear and had the base machine shop fabricate them. It was amazing what you could buy with a case of beer! The entire squadron took an interest in the project. As his tour was coming to an end, John finally completed the model. John with the Stinger in Thailand in 1972. The model lost an engine in flight, which led to a crash, but it sustained only minor damage. John scavenged stars and bars decals from a plastic model kit and added them to the booms. Using vinyl, he added the tail number 72-725. (John’s return-from-overseas date was July 25, 1972.) The unit’s scheduler placed the Stinger 72-725 on the board, so John’s model was now officially part of the squadron. The morning of the flight came and John broke in the engines on a test stand. When he was happy with the engines, he installed them in the airplane and went to the perimeter road. A sizeable crowd gathered to witness the first flight. John pushed the throttle stick forward and his Stinger lifted into the air. When it reached a safe altitude, John set the elevator and aileron trims and flew several circuits around the field. The elevator was sensitive because he set it up with plenty of throw. At the time, dual rates were rare. John was making low passes to see how his model would land when one of the engines quit. The Stinger suddenly rolled and crashed into the tall grass. The ground was wet so the mud and grass absorbed most of the impact. Damage was limited to the nose area. John wasn’t disappointed. His model Stinger flew successfully and he was heading home in a few days. The Air Force made a custom-built a crate for the Stinger and John took it home to Kansas with him. Mike Plummer handled the restoration of the Stinger, which included rebuilding the nose section. John became busy with his career and family, and although he continued to participate in RC, he never got around to repairing his Stinger. Although still in his possession, the Stinger was forgotten for the next 40 years. John’s old unit, the 18th SOS, changed missions and became the 18th Flight Test Squadron (FLTS), which tests all modifications to AFSOC aircraft before a production decision. The AC-119 Association was planning its 2012 reunion in Fort Walton Beach, Florida. In the email exchanges, several asked about John’s model Stinger. He let the association know he still had it and he was willing to bring it to the reunion. Lee Kyser contacted the Eglin Aero Modellers club to see if we knew of any RC modelers in the Fort Walton Beach area who would be willing to repair the model and fly it for the AC-119 Association members. We couldn’t say “We’ll do it!” fast enough. I closed the loop with Lee and things were set in motion. The first thing I realized was that I needed a top-notch team to pull off the project. The club has many talented members, all of whom were willing to help. First, I needed someone to repair the model and restore the finish so I asked Mike Plummer who is one of best builders I’ve ever seen. He’s definitely a top talent. I needed a pilot and Carlos Reyes was my first choice. He’s one of the best in the club, and he has much experience with Scale models and twins. Setting up engines for twin operation is an art. Ed Moorman broke in the engines and set them up before installation. Those who read Ed’s column in RC Report know he is an expert on twin engine setup and operation. During a planning teleconference, Lee asked if we could conduct a simulated mission over the Ho Chi Minh Trail. The trail would have a target truck and we were to blow it up with firecrackers and smoke bombs. I was a model rocketeer in my younger days so I felt I could safely rig fireworks for remote electrical ignition. Finally, I needed a driver for the truck. I selected Cody Powell because his parents are both Air Force officers serving in AFSOC units. We decided to conduct the demonstration flight at a recreational facility in Niceville, Florida: the Mullet Festival Site. We chose this location because access to our field is difficult and it is much easier for the AC-119 Association members to drive in and out of the Mullet Festival Site. Jim Baughman, of the Niceville recreation department, approved the special effects. The only drawback to the Mullet Festival Site was that it’s slightly small and it’s a grass field, which was a concern for the Stinger and its small wheels. Lt. Col. Kevin Huebert, 18th FLTS Operations Officer, agreed to support the event and he appointed Maj. Gregg Holasut to arrange for the public address system and seating for AC-119 Association attendees. John obtained the dimensions for the scale details by taking photographs of his roommate, Terry Stokka, standing next to the full-scale Stinger while holding a makeshift yardstick! John elected to drive his model here. I met him and we loaded it into my truck. My first impression was wow! The Stinger has several features such as plug-in wings and provisions for remote onboard glow, which were rare in 1972. It also featured remarkable scale details such as guns protruding from the left side of the fuselage and the sensors and flare dispenser in the doors. John described designing the model. He got the overall dimensions and three-views from the aircraft tech orders. He changed the airfoil to a NACA 2415 Clark-Y and enlarged the wingspan and area by 10%. 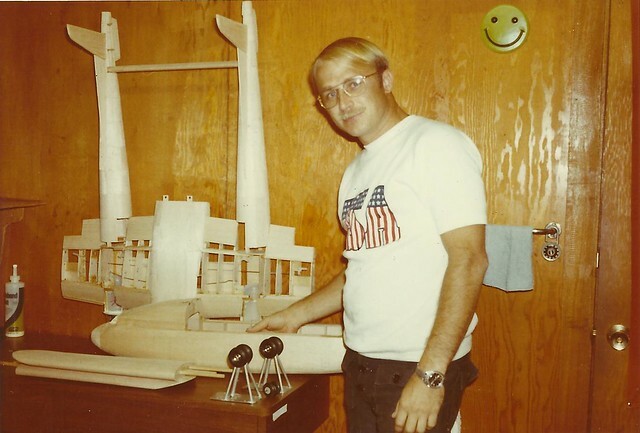 One amazing part of the design is that John obtained the dimensions for the scale details by taking photographs of his roommate, Terry Stokka, standing next to the aircraft while holding a makeshift yardstick! I delivered the Stinger to Mike and we began assessing what we needed to restore the model. The old Enya 45s had seized and the radio gear had been removed. We ordered two O.S. .46AX engines and some Hitec HS-425BB servos. As Mike worked through the restoration, a few complications came up. The inner wing and nacelle skins did not provide any means to access the fuel tanks. Mike had to carefully cut out part of the skins to replace the tanks. He also updated the servo installation. He changed John’s model from a single aileron servo and bell cranks to dual aileron servos and a separate servo for nose-wheel steering. Although rebuilding the nose section was fairly straightforward, Mike simplified the construction. In his original build, John had made clear windshields by heating scraps of plastic over a candle. Mike chose to create the proper facets and curves in balsa and paint the windows. Because the model did not have cockpit details, little was lost. The finish had aged in 40 years and needed to be restored. Mike used enamel model paints because they are readily available in the correct camouflage colors. He sprayed the Stinger with satin-finish KlassKote epoxy to protect the paint from fuel. While Mike was completing the build, Ed Moorman tweaked the O.S. 46s. They dropped right in the Kraft engine mounts that John had originally used. Mike moved the engines approximately 3/8 inch forward from where the Enyas were to avoid pinching the fuel and pressure lines. Mike added a pair of Higley Hubs to the O.S. engines to give the look of the Hamilton Standard propellers. Mike loaned his Futaba 8FG to the effort. We tested the engines in the Stinger on September 23 and Carlos taxied it around to get a feel for ground handling. We originally planned to test-fly and trim the model before the gathering, but John and the reunion planners requested that we not fly it in advance. They were concerned that if something went wrong on the test flight, there wouldn’t be enough time to rebuild it. Carlos Reyes and John Hupe pilot the Stinger at the AC-119 Association reunion 40 years after the aircraft’s first and only flight. On the following Thursday, September 27, John arrived in town. Mike and I met him at the Mullet Festival Site. He was amazed when he saw how well Mike had restored his Stinger. We performed high-speed taxi testing to ensure the model would take off from the grass. After a couple of high-speed runs, all concerns about taking off from grass were alleviated. The O.S. engines had sufficient power to overcome drag from the grass. On Saturday, several Eglin Aero Modellers arrived early and moved the soccer goals to the sides. I rigged two sets of firecrackers with model rocket igniters and set them in place. Lt. Col. Huebert and his team from the 18th Flight Test Squadron arrived and set up the sound system and seating. Mike brought the Stinger and we displayed it and took pictures before the show. Finally, everyone arrived and the show team was ready. Mike fueled the Stinger and set it in position for takeoff. Carlos and John took their positions on the pilots’ line. Craig Deyerle and I were safety observers. Lee and his flight crew read the checklists over the microphone. When the takeoff checklist was complete, Carlos advanced the throttle. Remember, this model hadn’t flown in 40 years and Carlos was flying the show flight without any test or trim flights. Although he was nervous, Carlos kept his cool and his performance was steady the entire flight. The aircraft rose from the ground and as it climbed out, the crowd went wild with applause. It was a success and John’s Stinger was flying again! Carlos made a couple of laps around the field to set the trims and get a feel for the airplane. Lee and the flight crew read the prestrike checklist and Carlos put the Stinger into a scalelike left pylon turn. Cody drove the truck out into the field and Lee played the sound of Gatling guns over the microphone. It was time to blow something up! I made contact and nothing happened! My best guess is that I didn’t get a good contact between the rocket igniter and the firecracker fuses. Cody tried to drive the truck over the second firecracker set, but it got caught in the grass. Cody picked the truck up and carried it to the spot and I made contact with the leads for the second pack of firecrackers. The firecrackers went off, simulating 20mm and 7.62mm explosive rounds hitting. A few seconds later, the truck was engulfed in a cloud of smoke. We had a kill and the mission was complete. Carlos then made some spectacular low photo passes. After the photo passes, Carlos hit the trainer switch and John was on the buddy box flying his Stinger for the first time in 40 years! He made three laps around the field, with his knees knocking the entire time. John Hupe carries the AC-119K Stinger after its successful flight. All good things must end. Lee called a low-fuel warning and Carlos set up the landing approach. John’s Stinger touched down to another round of applause from the crowd. Stinger 72-725 was safely on the ground after flying its second and final flight. We broke out the champagne and celebrated a successful event. During the social time that followed the flight, I talked with AC-119 Association member Robert Derr and his wife. Robert was impressed with the flight and noted some differences between the model’s performance versus that of the full-scale Stinger. Making an appropriate analogy, he told me that if the full-scale AC-119 were as fast as the model, it would have been a time machine. In a sense, the model AC-119 was a time machine. For a few minutes, John was back in 1972, his last combat mission was behind him and his incredible AC-119K Stinger took to the skies over Thailand. Mike took the Stinger home and reinstalled the old Enyas. On Monday, October 1, Mike, Ron, and I took the Stinger to Hurlburt Field for the donation ceremony at the 18th FLTS. Lt. Col. Huebert said the model will join the squadron heritage collection where it will be prominently displayed, hanging in the lobby of the squadron building. This is a fitting final resting place. It isn’t just any RC model; it is a historic artifact and an expression of the heart and soul of an Air Commando. In addition to the restoration and flight team, I would like to thank Jim Baughman with the City of Niceville Department of Recreation for allowing us to use the Mullet Festival Site and Lois Mock at AMA Headquarters for her assistance with the site insurance. Thanks also to Eglin Aero Modellers club members Denny Mangum and Exor Reyes who submitted photos to supplement mine. Great story. Brings back vivid memories of my visit to the Mekong Delta 1969-71. On R&R in Taiwan I found a Berkley kit of a rc B-26 Invader. I spent much of my free time during my tour building and converting it to control line. It was a great model with about a 90 inch wingspan and pair of Enya 35s. On another R&R I bought an Enco lathe/mill to make various parts including exhaust flapper valves to act as throttles. I finished it before leaving Vietnam but did not get a chance to fly it. The Army shipped it back to the states where I got in one very nice flight before moving on with my life. The B-26 went into my parents attic. In the 1980s I went looking for it to find my Mom had given it to a kid down the street. She swore she thought I was finished playing with the toy airplanes. This was a great article and I loved the story line. Good job guys. Wonderful story, it gave me teary eyes. I am slso a Vietnam Era Vetran and the friends we meet in the service are cherished and hold a deep place in our hearts. The good memories live while the bad fade and objects of joy like this old rc plane are more important and meaningful than words are capable of expressing. My USAF ROTC instructor (Maj. Boozer (!)) in 1974 was a former AC-119 pilot. I built a plastic model AC-119 duplicating the plane he flew in Vietnam for him. Don't know what happened to it. I retired in 2005 and now fly mostly indoor RC.